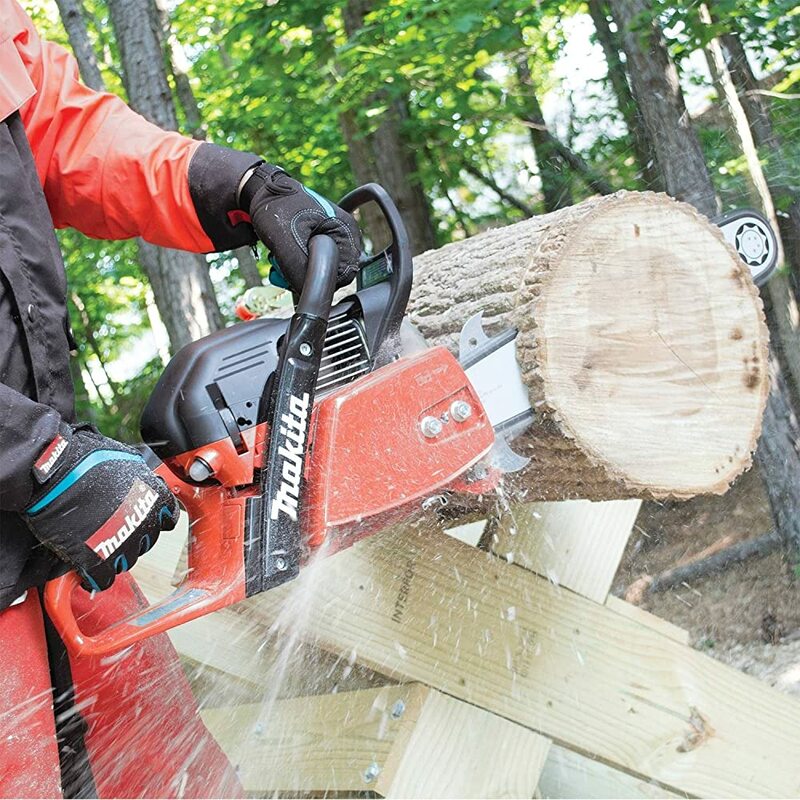 In this post, we’ll be exploring the best professional chainsaw options, as well as the considerations to make when buying one. 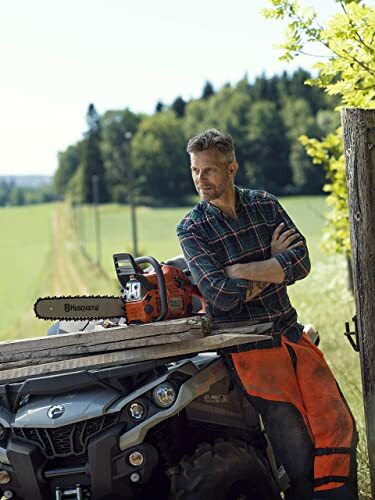 Husqvarna is one of the reputable manufacturers of chainsaws. 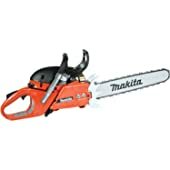 This particular model is one of the best professional chainsaws around. The Husqvarna 460 Rancher boasts of a 60 cubic centimeter capacity engine together with a 24 inches long chain bar. Consequently, the saw makes light work of thick, heavy tree trunks. Since gas engines are known to produce non-environment-friendly fumes, the 460 Rancher has an X-Torq feature to mitigate for these drawbacks. The system lowers fuel consumption rates, thus reducing emissions to acceptable levels. Air injection technology uses centrifugal forces to clean the intake air before combustion, thereby extending engine life. LowVib system absorbs vibrations resulting from the engine, lessening operator stress level. The start and stop switches are combined, making the machine easy to operate. A smart start system put in place incorporates a fuel pump for easy starting. Additionally, the oil pump has provision for making adjustments in the amount of oil discharged depending on prevailing conditions. Whether it’s a ranch, around your home, or out in the woods, the Makita DCS6421RFG is one of the best tools for wood sawing. Among the top professional chainsaws, I find this particular model very powerful, especially when you need to tackle hardwood trees. Weighing about 21.8 pounds, this chainsaw has a 64 cubic centimeters engine that produces up to 4.7 Horsepower of energy. In return, the torque produced turns the chain to a maximum speed of 13,500 revolutions per minute. High power to engine weight ration maximizes on the performance characteristics. At the same time, it doesn’t become much of a burden to the operator. An automated half throttle lock and an electronic ignition optimizes starting time, regardless of the running speeds. The compartment that holds the chain in place has easy access, making for an easy to clean equipment. During the cold weather, you can use the slide-out baffle for better starting efficiency. Large metallic spike bar increases cutting efficiency. Among the professional chainsaws, the Echo CS-600P scores being in terms of safety features. Ask any random professional lumber you meet on the streets about their top chainsaw brands, and Echo is most likely to be in there, with good reasons. From first sight, you can tell it’s crafted from high-quality materials. Do not let the pricing put you off. In this review, I am putting up the Echo CS-600P as one of the most expensive. Part of the justification for the high price is the professional-grade 59.8-cc engine. 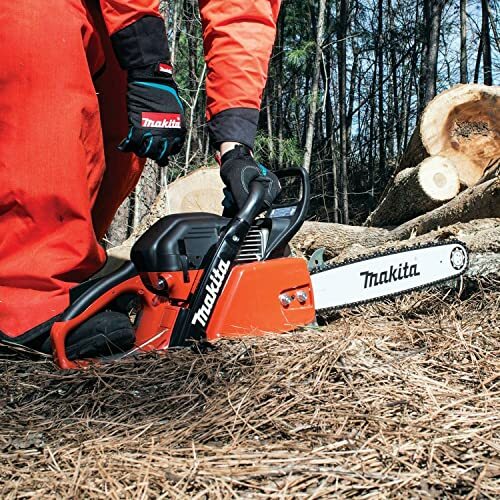 The engine power is transmitted to the 20” long chain bar for deeper cuts on medium-sized tree branches. Engine timing has been automated through the incorporation of a digital ignition system. Chain bar and the chain itself are tuned for professional performances. To reduce on lubricating oil wastage, the oiler is clutch driven, meaning it distributes the oil depending on the speed at which the engine runs. A decompression valve further eases the starting process. 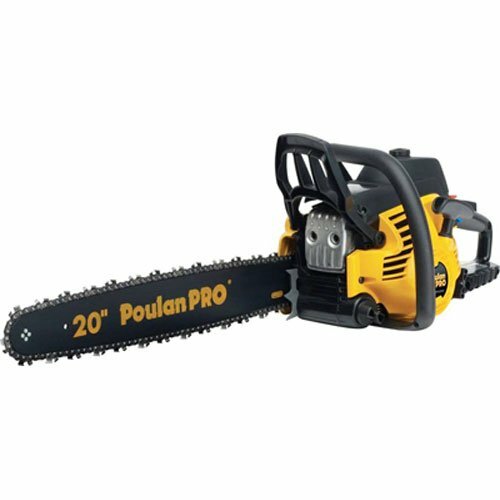 The Poulan Pro PP5020AV is one of the popular professional chainsaws currently available. Its 20” long chain bar is part of the reason for its popularity. It is easy to maneuver, unlike the long 24” counterparts, yet capable of handling relatively thick trees. The 2-stroke, 50-cc gas powered engine has been made to last for long, giving you great value for the cost you spend on the chainsaw. A centrifugal air filter cleaning system keeps the filter super clean, thus extending its life span. A starting system which features an effortless pulling system reduces operator effort when starting the machine. Once operational, the handle anti-vibration mechanisms dampen most of the rocking from the engine, making it gentle to operate. An automated chain oiler relieves an operator of the task of regularly squirting oil onto the chain bar any time it is operational. Part of the package includes a carrying case for the chainsaw. You wouldn’t have to spend extra bucks separately buying one. The Remington RM4620 Outlaw is powered by a 2-cycle, 46-cc gas engine. In turn, the engine power is transmitted to the 20” chain bar. Renowned for its durability, this chainsaw features a robust engine comprising of chrome cylinders and die-cast iron chassis. Similarly, the chainsaw comes with a sturdy chain tensioning mechanism on its side. It is easy to access and keeps the chain at the appropriate tension, even when the tool runs for long hours. A 5-point system of vibration dampening together with cushiony handles assures operators of their comfort. 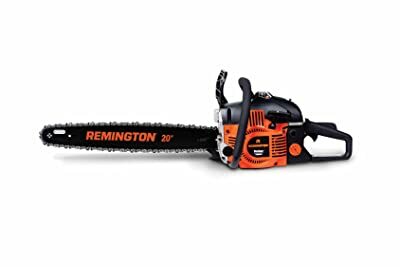 Rather surprisingly, this chainsaw falls under the budget category which isn’t expected of one of the best professional chainsaws around. The power and performance characteristics are what you would expect from the high end, expensive models. The tool goes about its job with minimal fuss. A heavy metal construction eliminates the use of plastics meant to cut down on weight. Again, it doesn’t weigh much. It revs up quickly once stated so you can get back to lumbering. Because of the sheer power, cutting speeds, and size of professionals, they aren’t meant for anyone. I have used them on several occasions, those tools require so much mastery to operate. The same applies to the buying process. Most of the time, users are tempted to buy the most powerful chainsaw. While in essence, it is not the best choice for their needs. I have broken down the things you should keep in mind as you shop around for a professional chainsaw. You have already established that you should own a top performance chainsaw. But what sets these apart from other chainsaws? Performance characteristics simply refer to what makes the tool tick, and the level of ease with which it accomplishes cutting tasks. I have divided these features into three: the engine power, cutting speed, and depth of cut. 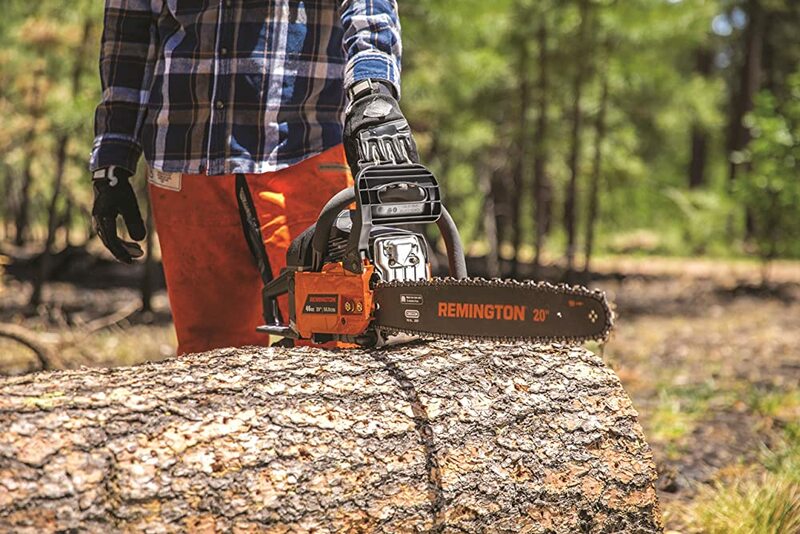 Simply put, more power means better handling capabilities for tough jobs, especially hard or thick wood. These types of jobs call for considerable torque to cut through the rigid trees. Thus, gas-powered chainsaws make the best professional chainsaws can buy for you. These are always beasts, capable of growling, snarling as they decimate the hard/soft woods day in, day out. The fumes and high noise levels may be a nuisance to some, but they do compensate for their massive firepower in comparison to corded and cordless chainsaws. Most of the time, the horsepower rating on the engine is a great indicator of just how powerful the chainsaw is. The higher, the better. Similarly, the engine capacity rating, often given in cubic centimeters (cc) is another indicator of the overall engine power. General, professional chainsaws have engines of between 40 and 80 cubic centimeters of engine displacement capacities. Your chainsaw wouldn’t be professional grade if it is handicapped in cutting some tree, would it? The length of chain bar fitted on it determines how deep the saw cuts, as well as the size of trees that you can fell. The chain bar refers to the protruding hardened steel blade which holds the chain in place on the chainsaw. Long bars accommodate longer chains than shorter ones, allowing the saw to penetrate deep into trees. Once you have figured out the probable tree diameters that you are most likely to encounter (it may not be possible at times), look for the most ideal bar length. What I usually do is increase the bar length by at least two inches, just in case I get to work on a large-sized tree. 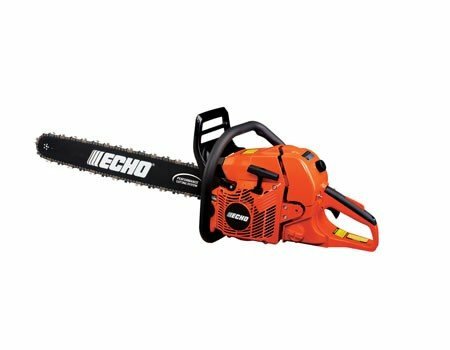 Most of the professional chainsaws I have interacted with have chain bars of at least 10 inches and a maximum of 24 inches. You can vary the lengths in between, depending on your research on probable working environments. A bar of 24 inches is the most equipped when it comes to dealing with thick cuts. As such, at no time will you be limited in terms of cutting possibilities. Having a long chain bar, relative to the tree diameters ensures you don’t wear down yourself and the machine. For a professional, taking forever to bring a tree down is out of the equation. As a professional arborist, getting the job done is one thing, getting it done fast is an added bonus. While most of the professional chainsaws around will eventually get the job done, the time taken is a key factor to have in consideration. Getting the job over and done with fast makes you more productive, thus getting you a better return on your investment. As you look out for this feature, also consider the correlation between the chain sharpness and cutting speed. As a result, you may want to invest in a chain sharpened to keep it sharp all of the time. With great power come great responsibilities. As with any powerful tool, it is bound to wear out fast due to the repeated usage. It is through rigorous maintenance works that you can keep the tool in good shape. I know people tend to shy away from equipment that needs regular attention. However, the best professional chainsaw that you opt for doesn’t necessarily have to be a pain to maintain. Ideally, you shouldn’t be spending too much time servicing the saw. Instead, you need to be out working. Look for a saw with a modular design that allows for easy disassembly, and subsequent assembling when you are done. And since you are a professional, you would be able to work on it yourself, without having to wait for a service guy to sort it out. Essentially, you then get back to work as soon as possible, thereby improving your productivity. To this regard, ensure you are familiar with the maintenance procedures of gas chainsaws. The longevity of your tool and your safety depends on it. These powerful tools are quite dangerous if not handled in the manner in which they are supposed to. Ease of maintenance and use are two different things. The truth is, a professional chainsaw is a very powerful tool. That means it is also dangerous in equal measure if you are not up to the task of using one. Consequently, buy one that is not too cumbersome to be used by you, or anybody else. Consider the weight, positioning of the handles, machine balance when held, and the ease of access to the tool controls. If the tool is too heavy, is fitted with obstinate handling capabilities, and difficult to control, then it wears you down real fast, taking a huge toll on your body. Just in case you are making the purchase at a store, have a feel of the chainsaw before you buy it. It would give you a vague idea of how it would work in an ideal working environment. The handles have to be ergonomically designed, with soft, non-slip grips lined into them. Otherwise, if the purchase is online, scroll through the reviews section. Pay attention to the comments on how light, easy to use, and balanced the tool is. Chainsaw reviewers often have genuine comments that you can rely on as you make your purchase. Ease of use is great for reducing fatigue, boosting operation efficiency, and alleviating imbalances that are common among power tools. Additionally, the starting system has to be one that doesn’t take forever to start. Time is money. All that time you spend pulling on cords, you should spend doing something else. Starting technologies differ from model to model. In whichever case, look for spring assisted starting systems. These limits the number of times you engage the throttle. Other systems have a choke control for better starting efficiency. Handling also forms a significant part of the ease of use. Consider chainsaws with a two-handle option. These have a top and rear handle. Rear handles come in handy when cutting trees already on the ground. On the other hand, the top handle is used for works at elevated heights. Also, the handle lessens the burden of cutting at awkward angles. The best professional chainsaws have lucrative warranties which cover you from design flaws and damages beyond your control. Because of the existence of flawed chainsaws, a warranty is a good feature to consider. Read through the listed terms and conditions by the manufacturer so that you know what you are getting into. Take an extra step and do some research on how the manufacturer handles warranty claims. Accept that model only when you are satisfied with their reputation. It doesn’t matter whether you are relaxed in your living room, having a drink with friends, or out felling trees. Your safety should be a priority. First, look for a manual chain brake feature that stops the chain in an instant whenever a situation demands. A chain stopper and catcher are other features that are a must-have in the event the chain snaps mid-operation. It keeps it in check, preventing the speeding chain from hitting you. Other safety features include anti-vibration, anti-kickback, and easy to access stop button/switch. Lockout switches are other critical features for preventing an accidental startup of the chainsaw. There you have it. A review of the best professional chainsaws that are currently available and the features that make them stand out. A chainsaw is one tool that you have to take every precaution when buying one. If you don’t, then you may never get real value for your money. The best chainsaws are those that you don’t have to force down onto the tree/logs. Rather, it seamlessly mows through even the toughest of trees. 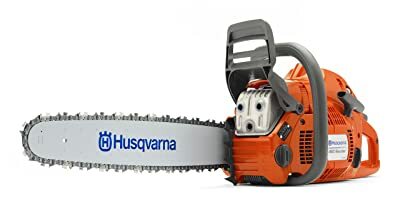 In my opinion, the Husqvarna 460 Rancher is the best professional chainsaw because of the bar length, engine power, safety features, ease of maintenance, and ease of use. An interchangeable bar or a chainsaw that accommodates different bar lengths is a big plus. You can swap these with what you have at hand or in accordance with the task at hand. 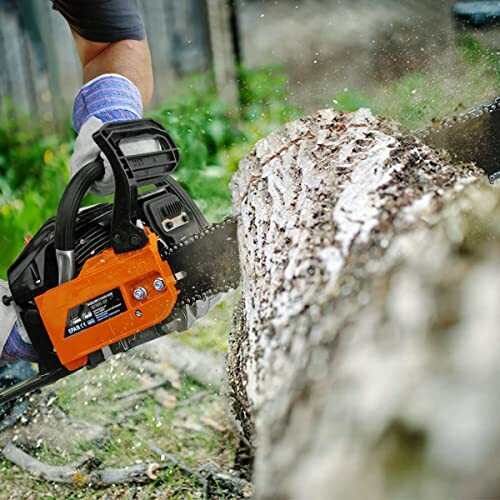 Coupled with high fuel efficiencies, smart start system, an adjustable oil pump, and an easy to release air filter, then you have an all-round professional chainsaw for all your needs.